The minivan. Elevated station wagon, suburban godsend, or glorified toaster? My distaste for the minivan started right from the beginning. I came from a big family with four kids, and when you have four kids, you need something BIG to lug them around in. Growing up we always had full sized vans. Vans with three rows of seats. A van where you could literally sit 9 feet behind the driver and them not being able to hear you over the 8-track due to the large distance. A van that held two parents, four kids, three friends, all their gear, and at least one dog. I guess I'm just a big van snob. Oh and our van was extra special, even "tripped out" for 1970's standards. It was butterscotch and white, with tinted windows, and sticker that said "keep on vanning" in the back window, and as a bonus came with two huge silver side pipes that got very HOT. 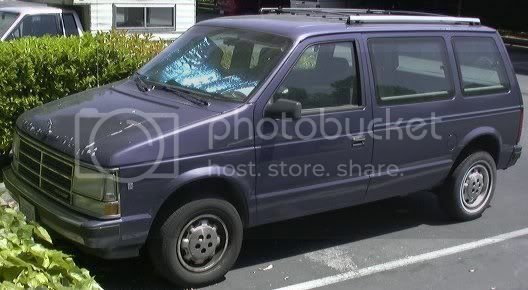 Many a neighbor kid burnt the back of their legs getting out of our "hooptie van" as we so affectionately called it. Road scars, my dad proudly called them. Then the minivan came along, and yuppie soccer moms everywhere rejoiced. Boxy and clumsy looking, low ceiling, and guaranteed to be going 5 mph under the speed limit in any given fast lane. They were apparently pre-wired with GPS tracking devices that refused to let them pass any Costco or Walmart parking lot. Conducting my own experiments one year, everyday on my way home from work I would keep track of how many minivans would turn into Costco or try to pass it. Almost religiously that left blinker would come on and into Costco they would turn, giving the illusion it was impossible for them to keep driving. Must buy in bulk. Must buy in bulk. When I was a swingin' single, I was in the market for a new car. I researched the type of car I wanted (good commuting car with great gas mileage) and the chauvinist car dealer tried to steer me away from my car and into a minivan since at the ripe old age of 20 I looked like I was about to pop out two or more kids. I remember being so offended that I had done my homework but just because I was female I should be planning ahead for my destiny to own a minivan. I thought heck, even with two kids they'll still fit in my four door sedan. Right then and there I vowed I would never own a minivan of my own. My friends with kids scoffed. You just wait they said. Once you have a few kids you'll be begging for a minivan. Well I guess that remains to be seen. Baby #2 is on the way and I'm still happy with my cute four door commuter car. There are many family car options out there, I just know for me that it will never be a minivan. I do have to give kudos to my good friend Jill, who although has succumbed to a minivan, has not fallen victim to the minivan "way". She has proceeded to paint biker flames all over it, and has an Ozzy Osborne key chain hanging from the rear view. Now that's going out with STYLE. Love the blog, I will visit often. I TOTALLY concur on the whole mini van thing. Nothing sys my husband isn’t getting any like a Toyota Sienna, a pair of mom jeans, and an appliquéd Christmas sweater. I purely hate mini vans and vowed never to own the one vehicle that appears to rob woman of their sexuality and simultaneously cause them to breed. All the Mormon moms around here drive them. They remind me of giant playpens. Two of my dearest friends drive these, neither one shaves their legs or owns any shoe with a heel or mascara. Came across your blog and found myself reading all your posts. I haven't done that to many of the sites here. Your fun to read. Just a note on the minivan thing....Right now that your baby (and soon to be babies) are small, it won't matter much what kind of car you drive as long as you can fit a carseat into it, but wait till those kids get old enough to want to bring their friends along....you run out of space FAST. From your post, it seems that you know all about "taking the friends along."